It was a cold night near freezing point and it’s now warming up slightly in the sun. Planting out, breaking up clods of earth and replanting vital parts. I carefully pull out the thick white roots of the couch grass and store the rue and white mullein seedlings to be placed between the large groups of perennials. I sit with my hands in the earth and I smell the earth. The life I find between the granular soil and clods of earth fascinates me. I encounter numerous earthworms. They are not yet deeper than 20cm. A few brown and yellow snails have bricked up their house in order to prevent freezing, some woodlice here and there and a pile of slug eggs 3mm in size. A mole obviously enjoyed itself a little earlier in the year but was subsequently caught or left of its own accord, the hollow spaces left behind have not been used for some time. The drawn and coloured school chart from primary school with Momfer’s cheerful face on it, the cross section of the soil with all its life. I still remember it well. I see the earth as the food storehouse of the plants, all kinds of delicacies that are carefully prepared by the larger and smaller soil life. 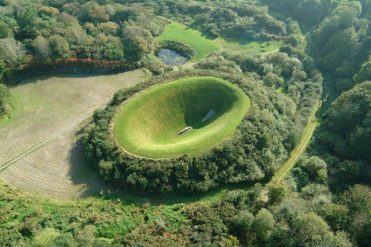 As a child, I had the idea that if I placed the plant in the earth and pressed down with my hands that I transferred my energy to the plant, so that it would grow more easily at its new spot. Numerous races and religions have a connection with earth and soil. The Aboriginals, for example, consider the earth to be holy, one of the most important conditions for the existence of nature, which they feel responsible for and which, it goes without saying, they are part of (just like us for that matter). Earth has an amazing insulating function. 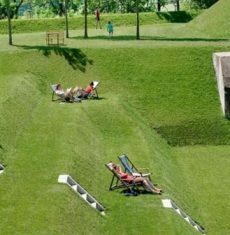 Architects like to make use of that characteristic in mountain areas by building part of the home in the earth, and we’ve been building houses with cellars, in any case, for centuries. Larger country homes/castles have/had icehouses, which ensured that the frozen ice from the winter could still be used until deep into spring. In parts of Russia, people still live underground. Contact with earth is vital to them. Earth is an umbrella term for peat, clay, sand and a combination hereof. As a naturalist, I know it well: immersing myself in the swampy peat, plodding through the wet, muddy clay, trailing through the shifting sand. Clay and sand are also building materials: baked clay in the form of roofing tiles, engineering bricks and paving bricks, sand as raw material for cement, concrete and chalk products. Visual artists can choose from many types of clay and sand, the material inspires; it is malleable, flexible and three dimensional. Peat has/ had no function as a building material, although; where people wanted to build a wooden home in peat areas 700 years ago, peat sods were used to raise the structure, as it didn’t weigh down the subsoil (which sand does) and because the ditchwater and groundwater was not yet pumped away, the peat did not consolidate and the house remained reasonably straight. It is striking that clay and sand do not disappear, while peat does. We have already used a lot of it as fuel and many cubic metres of it have disappeared through consolidation. 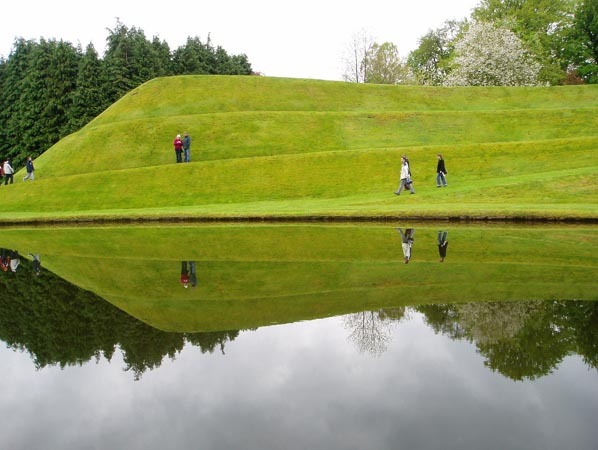 Earth plays a major role in the forms and function of gardens and landscapes. A good example of this is the English ‘ha-ha’. 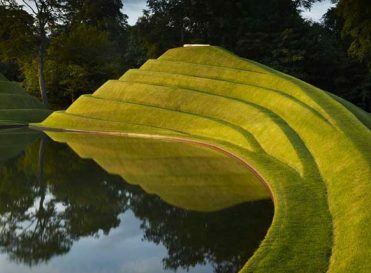 This was conceived as a function and is a thing of beauty in the landscape when used well. The aim is not to interrupt the view of the landscape through fencing, so that the livestock can come as close to the living room as one wishes. It can also be used in our country, experience has shown! The terraced rice fields on hillsides in Indonesia, designed with function in mind and an example to landscape art, also offer an impressive picture of how earth can be used in terms of form and function. 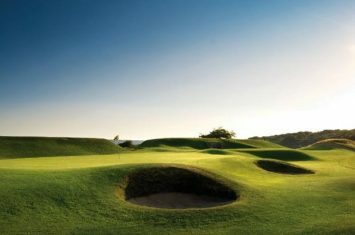 Our clay and sand are great materials for sculptural bodies of earth; the dykes, the stabilised roads, noise barriers, but also the more beautiful golf courses; the covered active dunes broken up by water and greenery. You can therefore say that a lot of formed earth is connected with function and as a creative professional, you strive to make this beauty visible to everyone, as well as emphasising its usefulness and recreational quality. There are plants which it is hard to find a spot for, because they are so terribly discerning and you have plants that survive where you think to yourself ‘how is it possible’! Marram grass is one such example, long penetrating/developing roots form in powdery dry sand and come to the surface at one spot each time. So valuable for our dunes that it grips the sand in this way, a gift you could say, because which other plant grips this shifting sand so tightly. Hats off therefore. With its noble, powerful appearance, this airy stunner could be useful, but unfortunately it is too demanding and is uncontrollable. 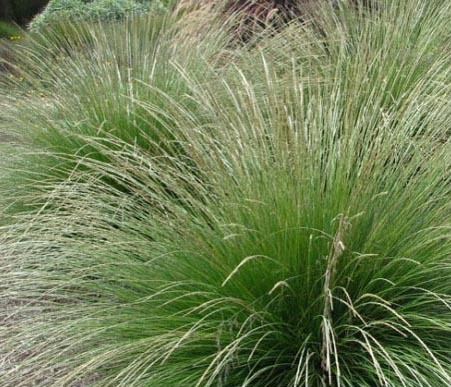 There are several types of grass that can be planted in powdery dry earth on a southern slope and the Festuca mairei is one of them. Because the bloom is not pronounced, its design quality mainly lies in its dense, bushy form with its robust, powerful appearance, therefore going well together with hard elements and cropped shapes like in the photo example. That bushy, sturdy form is the basis for thin, transparent neighbours and solitary plants. 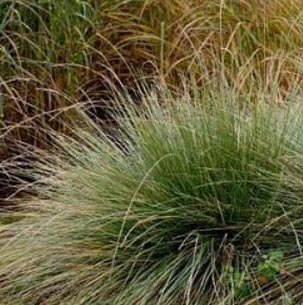 In my view, this Festuca is completely different to all other species of the grass family, such as Panicum, Calamagrostis, Molinia, Pennisetum, etc., and is therefore fascinating and challenging to use in different situations.